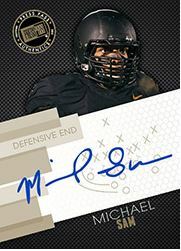 While Michael Sam is in Indianapolis this week for the NFL Combine, Press Pass Inc. is hard at work putting together the incoming 2014 Draft Class set and that will include autograph cards of Michael Sam. Earlier this week Press Pass Inc. announced “in conjunction with the return of its Press Pass Football product line, the first on-cards autographs of the incoming 2014 draft class. Collectors will have the opportunity to receive a free autograph card of ground-breaking rookie, Michael Sam.” The release goes on to say that each hobby box will contain 6 autos from players like Johnny Manziel, Jadeveon Clowney, Teddy Bridgewater, Blake Bortles along with many others. Also found this little item for dealers to spend alittle more on this product.